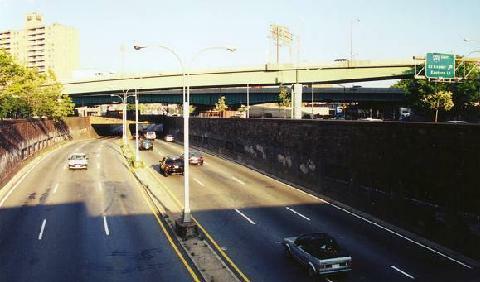 During the 1920's and 1930's, New York City began a program to widen Queens Boulevard. The project, which was conducted in conjunction with the building of the IND Queens Boulevard subway line, widened the boulevard to 12 lanes in some locations, and required a right-of-way of up to 200 feet. Once completed, local and express traffic flows were provided separate carriageways. SOURCES: "Master Plan: Express Highways, Parkways and Major Streets," New York City Planning Commission (1941); Office of the Queens Borough President; Jeff Saltzman. NY 25 shield by Ralph Herman.